Sgt. 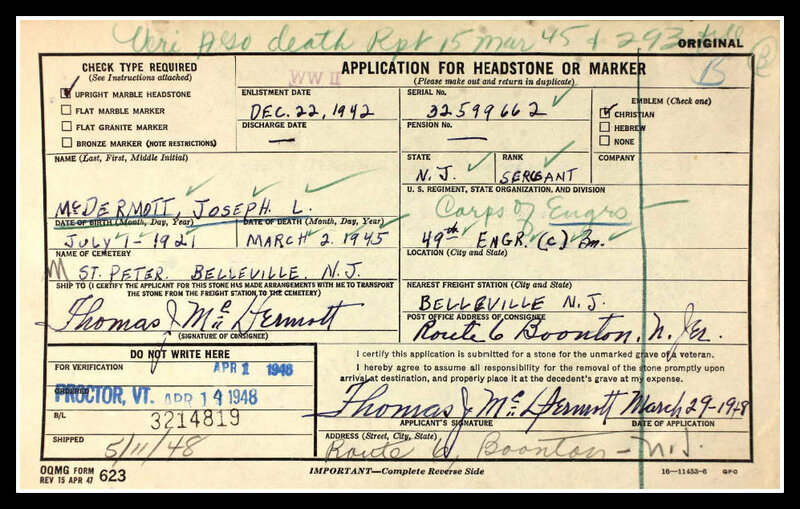 Joseph L. McDermott, 23, of 10 Washington Street, Belleville, suffered a fatal concussion from a bomb explosion on March 2, 1945. Born on July 1, 1921, McDermott enlisted in the Army on Dec. 22, 1942, serial number 32599662, taking basic training at Fort Dix, N.J., and further training in Colorado before heading to England. Sgt. McDermott served with the 49th Engineers Battalion. McDermott was born in Belleville to Grace and Thomas McDermott. He is survived by brothers Bart and Edward. He is buried at St. Peter’s Church Cemetery on William Street in Belleville.